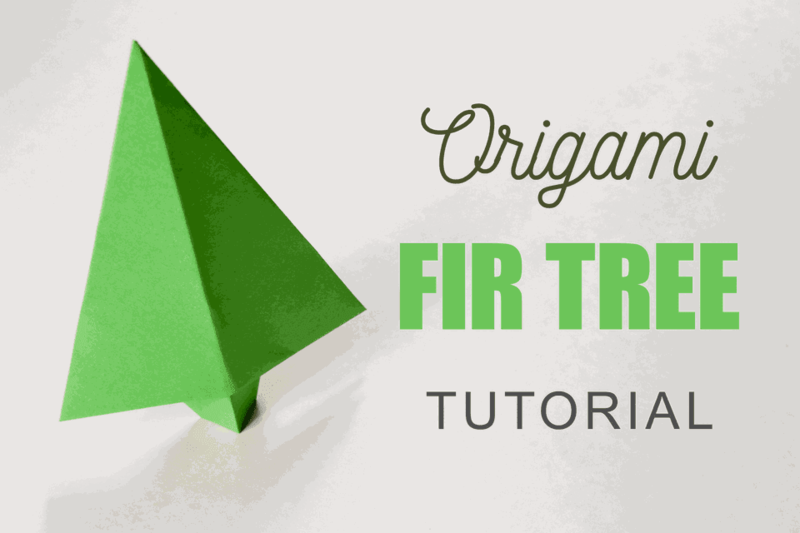 This Traditional Origami Fir Tree is great if you're making a DIY paper forest or countryside diorama with your kids! You could make an entire forest of them in under 10 minutes. Use different sizes and various colors to make it more interesting. These origami trees stand up on their own as well, making them perfect as table decorations and even cards, a message could be written on the back, then folded in half and sent as a sweet little pop-up card. You could also make 20 all the same, string them on some cotton and make a forest themed garland! Of course, these paper trees would be perfect at Christmas or winter time. All you will need is one square sheet of origami paper. For this tutorial, a paper that is 20 x 20 cm and solid colored was used. This origami model is very simple and only has a few basic folds. Firstly have your paper white side facing up if you have one. Fold the paper in half diagonally and then unfold. Now fold the right and left edges to align with the middle crease. Fold the bottom corner up to where the corners meet in the middle. Now fold the left and right lower edges into the middle. Fold the model up in half. Fold the top layer back down, leaving a gap of roughly 3-4 cm. Now turn the model over, folding the tree in half again so that it can stand up on its own. Such an easy model, you could make 10 of them in 10 minutes and have a whole forest! If you're a beginner, remember it might take a few goes to get an origami model right, so don't worry if your one looks a bit wrong! If you make one of these origami trees, tag #paperkawaii on Instagram or twitter so that I can have a look at them! For more tutorials and also video tutorials, the youtube channel called Paper Kawaii.